No cost Feasibility Study (FS) produced by SOLID California. FS includes technical analysis and economic analysis of the TESA. Decision if either a TESA or system purchase is beneficial. Upon execution of either the TESA or a purchase contract, a representative of SOLID California will serve as the building owner’s point-of-contact throughout the system installation process and for the duration of the TESA. 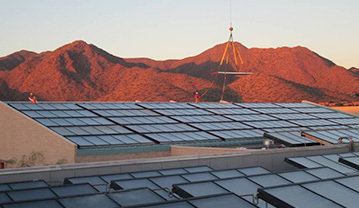 SOLID is the global leader in Solar Cooling and advanced Large Scale Solar Thermal Systems. 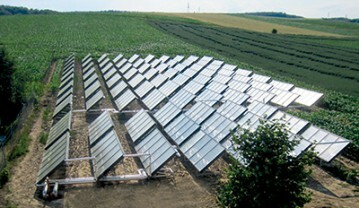 GREENoneTEC is the world’s leading manufacturer of high-quality solar thermal collectors and related mounting systems. ALMECO is the developer and manufacturer of the selective absorber“TINOX energy“, the core component in the collector. ADROIT is the perfect EPC partner in the team, based in San Diego since 1986 with many advanced reference projects in California. 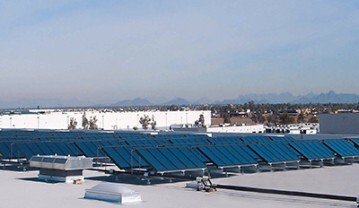 SOLID California, Inc. is a California subsidiary of SOLID GmbH of Austria and serves as system integrator for large heating and cooling projects using solar thermal systems. Founded in 1992 SOLID Austria has participated in many of the largest solar thermal projects in the USA over the last ten years. 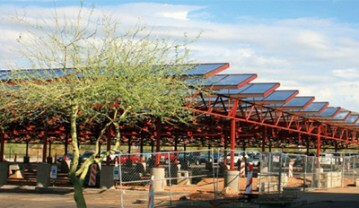 These systems have been installed for entities such as PepsiCo/Gatorade, Scottsdale Unified School District and Hyatt. More than 300 SOLID systems are in operation today all over the world. 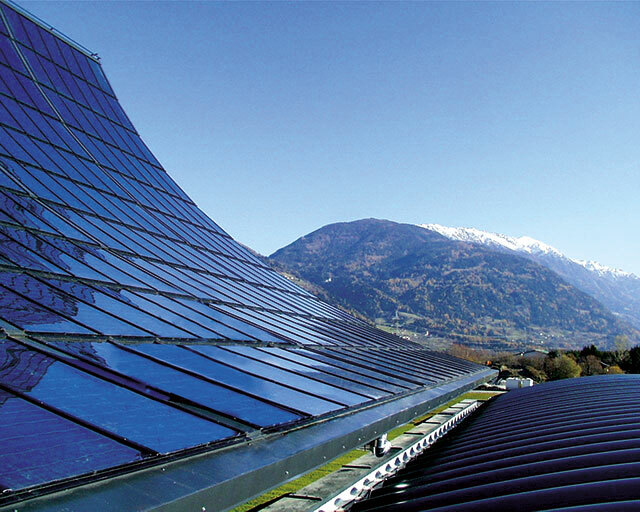 SOLID Austria is a world leader in solar cooling. 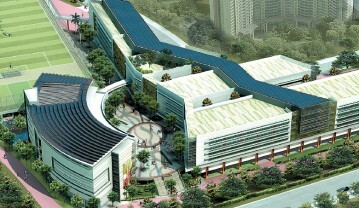 Smart systems for more sustainability! Today, typical SOLID systems have at least several thousand ft² of solar collector area and are designed to offset between 20-80% of the original energy consumption. 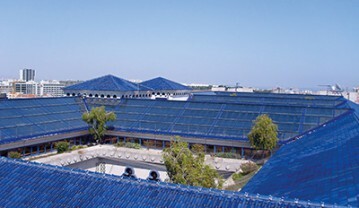 Using solar thermal collectors to produce hot water for a variety of applications such as bathing water in dorms, laundry water at a hotel, kitchen water at restaurants, etc. The technology can also be used to cool buildings to provide heating and cooling for industrial processes. A residential domestic hot water (DHW) system, is probably the most well-known Solar Thermal application. 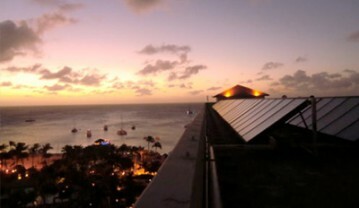 Today, systems covering tens of thousands of square feet, have become standard technologies for hotels, hospitals, and multi-family housing, supplying for free green energy for decades at no costs. For systems greater than a 100,000 ft² collector area, seasonal storage is becoming more popular. With seasonal storage, entire cities can benefit by using solar heat produced in the summer to provide heating in the winter. Absorption chillers are well known in the industry for cooling while using heat from a gas burner or steam as an energy source. Special high temperature flat plate collectors provide hot water at 200°F which is used by an absorption chiller to produce chilled water down to 42°F. The cold water is distributed via standard air handling units and fan coils for air conditioning buildings and for industrial processes. In addition to generate cooling, the solar cooling system can also provide domestic hot water. Many industrial processes run on temperature levels below 212°F. 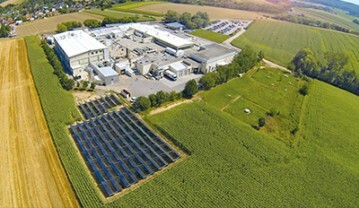 Solar process heating and cooling can substantially offset the plant’s energy usage. The food and beverage industry, chemical and textile industry, all cleaning processes etc. have a high potential to benefit from solar process heating and cooling. Our optimized custom solutions use other locally available energy sources, such as waste heat, which can provide the best environmental and economic results for the client. Completing over 300 installations since 1992, SOLID is an expert when it comes to working with commercial or governmental clients. We have been working with global institutions, such as UNIDO, World Bank, Harvard University, M.I.T., as well as several top international brands. Already back in 1998 we started to offer Thermal Energy Services Agreements (TESA) and gained high experiences in financing & economical operations of the system. 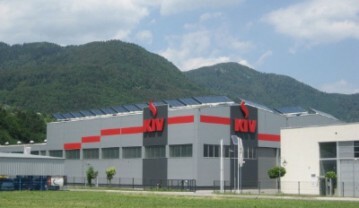 Several numbers of plants with an investment over 50 Mio. USD stand for our success in the field of TESA. The perfect correlation: The highest output of solar cooling systems is achieved when the cooling demand is at its maximum during the sunny hours of the day. Solar cooling therefore helps by reducing electricity use during the time of highest peak demand charges. 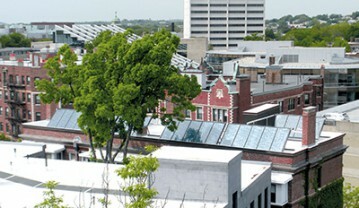 A Solar Hot Water system is easy to integrate, and provides the most efficient solar technology. It can deliver approximately 5 times more energy than a photovoltaic system of the same size. Using solar process heating and cooling as energy efficiency measure in industry has a high potential. Optimized solar system solutions including waste heat recovery create an ecological and economical added value. Are you interested to learn more? We offer a free feasibility study, that includes an analysis of your energy rates, savings and technical details. Contact us to schedule an appointment! 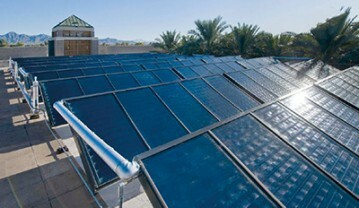 SOLID California offers tailor made Solar Thermal solutions. In California solar irradiation and governmental regulations are excellent! Conditions simply could not be better.